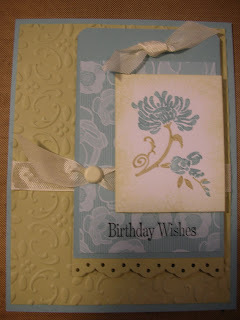 River Rock - not one of my favorite Stampin' Up! colors so I was determined to work with it and see if I could come to love it and I did! It looks so beautiful with Baja Breeze which really brings out the green tones in it. I had several comments from people about the color combination and their struggles with River Rock as well. Perhaps this card will help you get started using a color that hasn't captured your heart yet. If so, leave me a comment and let me know! Now's the Time to Sign Up with Stampin' Up! Stampin' Up! 's Sale-A-Bration Starts Today! Interested in a Free Stampin' Up! Tote? Back from Stampin' Up! Leadership Conference!